Here at WeAllSew, we love stitching up something with love to gift to friends and family during the holiday season. But we often struggle to come up with the perfect gift idea for the perfect person. So this year we’ve all come together to share our top gift ideas with you through tutorials and patterns for quick sewing projects that make great holiday gifts! Join us each week from now until Christmas for a weekly post with our favorite Sew Easy Holiday Gift recommendations, from decorations for the home to fashion accessories and even quickly quilted gifts. All perfect for friends and family from the young to the still young-at-heart. Oh, and if you want even MORE great projects, follow our Bernina USA facebook fanpage and twitter feed where we’ll be posting links to great gifts each and every day. 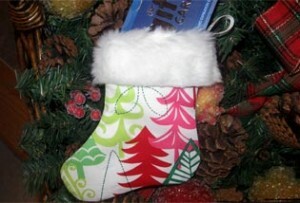 Make a quaint Quilted Holiday Stocking with this pattern made by our WeAllSew Expert Lisa. This fabulous project uses just three fabrics and two types of stitches. Get the downloadable PDF project and pattern by clicking here. Stitch up some adorable mini stockings t0 hang by your chimney with this project from our WeAllSew Expert Stacy. Perfectly personalized wrapping for a gift card or adding pizazz to your holiday decorations from decking the halls to trimming the tree. You can even create a new tradition with a mini-stocking advent calendar. Get the downloadable PDF project and pattern by clicking here. Add a touch of elegance with an Elvin Treasure stocking using embroidery designs and delicate trims. Find the instructions and pattern by clicking here. 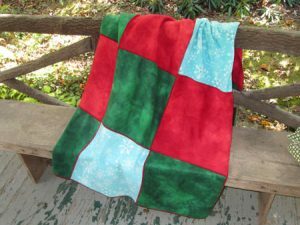 This quick and cuddly holiday patchwork fleece blanket from our WeAllSew Expert Jo is easier and faster to make than a quilt, and is a cheerful addition to your seasonal decor. Choose coordinating solids and prints from the selection of fleece available at your local fabric store, or use scraps from other fleece projects. Get the downloadable PDF project by clicking here. Decorate your table with napkins that are all dressed for the season with this project from our WeAllSew Expert Juliette, handmade Napkins and matching Kitchen Towel. Get the downloadable PDF project by clicking here.